The violent protests that erupted around Lebanon on Tuesday saw a reversal of familiar roles, as Sunni supporters of ousted, U.S.-backed Prime Minister Saad Hariri took to the streets to challenge Hizballah's move to take over the government. The streets, of course, are where the Shi'ite movement three years ago cemented the veto power it used to bring down Hariri's government. Now Hizballah has seized the reins, tapping billionaire Najib Mikati to head a new government dominated by the movement, and Sunnis are back on the streets. Hariri supporters blocked roads across the country and ransacked the offices of a rival Sunni politician, vowing to continue their protests until Hariri is restored to power. But Hizballah managed to win a slim parliamentary majority for Mikati, who was formally asked on Tuesday by President Michel Suleiman to head a new government. Mikati described his appointment as a "triumph of moderation over extremism." "I will cooperate fully with all Lebanese to form a new government that protects their unity and sovereignty," he said. The Sunni telecom billionaire from Tripoli is regarded as a politically moderate technocrat, close to Syrian President Bashar al-Assad, and respected across Lebanon's political divide. He served as Prime Minister briefly in 2005 as the head of an interim government in the aftermath of the assassination of former Prime Minister Rafiq Hariri, father of Saad. The Lebanese political system traditionally reserves the job of Prime Minister for a Sunni, but having won the nomination because of Hizballah's backing, Mikati placed himself in direct confrontation with Hariri, the paramount leader of Lebanon's Sunni community. Although Mikati's supporters say the procedure was entirely constitutional, attempting to restore his credibility with the majority of Sunnis is only one of the challenges facing the new Prime Minister. He and his allies have called on Hariri's March 14 coalition to join a government of national unity, but Hariri has ruled out serving under a Hizballah-backed Prime Minister. Mikati's government is likely to be composed largely of the political allies of Hizballah, and that could put it on a collision course with Western powers. The U.S. and the E.U. designate Hizballah a terrorist organization, making its political victory over Hariri a setback and complicating future dealings with Lebanon. "Our view of Hizballah is very well known," said Philip J. Crowley, the State Department spokesman, on Monday. "We see it as a terrorist organization, and will have great concerns about a government ... within which Hizballah plays a leading role." The Shi'ite movement, however, will likely maintain a low profile in a Mikati government, in which most Cabinet positions will likely go to its allies. Hizballah prioritizes the struggle against Israel and insists it has no desire to rule over all of Lebanon. "We are not power seekers. Until 2005, we did not take part in any Cabinet," Sheik Hassan Nasrallah, Hizballah's leader, said in a televised address on Tuesday afternoon. "The biggest forgery and lie is to accuse Hizballah of wanting to control the country ... and impose the Persian project"  a reference to his movement's Iranian sponsor. One of the first moves expected from the Mikati government is the cancellation of Lebanese consent for the international tribunal investigating Rafiq Hariri's murder. The Netherlands-based tribunal is close to issuing its first indictments, which are widely reported to include the names of Hizballah members. Hizballah says the tribunal is a political tool of the West, and toppled Saad Hariri's government two weeks ago by withdrawing its ministers and allies after the Prime Minister refused to cease cooperation with the tribunal. Disavowing the tribunal would do little to endear the Mikati government to the international community, and the U.N. Security Council would likely amend the tribunal's charter, allowing it to function without Lebanon's financial and judicial participation. More immediately, though, tensions between Lebanon's Sunnis and Shi'ites, which have been strained since Rafiq Hariri's assassination, look set for a dangerous escalation. "Iran is already ruling Iraq and Gaza, and now they want to rule here as well through Hizballah," says a protester who calls himself Omar, who is among a crowd of Hariri supporters who are barricading a Beirut intersection with burning tires and overturned garbage cans. Thick black smoke climbs into the clear blue sky as nearby soldiers watch intently. Some of the young men wear masks, and some have pistols stuffed into their waistbands. 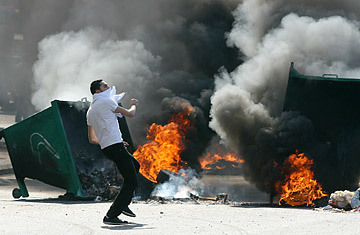 Other protesters cut the main highway leading to Syria and the coastal road between Beirut and Sidon in the south. At Haaret Naameh, nine miles south of Beirut, a crowd of angry Hariri supporters clashed with troops. The protesters claim that four civilians were shot and wounded when the soldiers opened fire on the crowd. The claim could not be immediately verified, although at least one protester had blood on his trousers and another showed a photograph on a cell phone of a young man with a bullet wound in his leg. "Two days ago they brought a new army unit here, and they are all Shi'ite. They provoked us and started shooting at us. They wouldn't shoot if it was Hizballah doing the protesting," says a young demonstrator, his head swathed in a checkered kaffiyeh scarf. As a cleric attempted to mediate, a group of protesters chanted support for Hariri and Saddam Hussein. Amid the rage of his supporters, Hariri called for calm and urged peaceful protest. "Anger cannot be expressed by cutting roads, burning tires or infringing the freedom of others, regardless of the motives," he says. Hariri's coalition has called for a mass protest on Tuesday evening in Martyrs' Square in downtown Beirut, the epicenter of the 2005 Cedar Revolution, which forced Syrian troops to withdraw from Lebanon. But Damascus has regained much of its influence, and it remains to be seen whether a weakened March 14 can win a battle for the streets against Hizballah, which prevailed last time around in both peaceful protests and armed confrontation. See "The Divided World of the Middle East." See pictures of Hizballah youth.